Members of Local 504 enjoy comprehensive health & welfare coverage for themselves and their families, and a generous retirement plan. Local 504 welfare and pension benefits are based on hourly contributions from union contractors for hours worked. Employers must remit contributions for hours worked by the 15th of the month following the month in which the work was performed. The rates at which the contractor must remit are based on the collective agreement in effect at that time, and vary according to your level of apprenticeship or journeyman status. The administrator maintains a Welfare & Pension account in your name that tracks the contributions received, and in the case of Welfare, the insurance premiums paid out. Insurance coverage will start on the 1st of the month following the accumulation of the required hours. Members may contact the plan administrator to determine if contributions have been received, and to confirm coverage. At retirement, members may continue their Health & Dental coverage. The goal of the Local 504 Pension fund is to provide members with a meaningful retirement income. 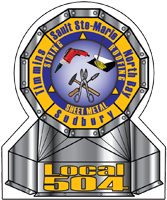 Pension contributions will be remitted by on a member’s behalf beginning with the 1st year of apprenticeship for a sheet metal worker. As with Welfare contributions, the hourly contribution rate will depend on the collective agreement and your level of apprenticeship. Members receive a pension statement and report showing hours worked throughout the year from the plan administrator annually. Members are advised to review these statements carefully to ensure the correct hours of work are being reported. You will be insured the 1st of the month following the accumulation of 200 hours. For example, if you started working in July, reached 200 hours midway through August, your insurance would be effective September 1. Should your insurance lapse due to temporary lay-off, you will be reinstated the first of the month following 200 hours worked once you return to work at a contributing contractor.